The Music Together® Preschool program helps all children learn music in developmentally appropriate ways. 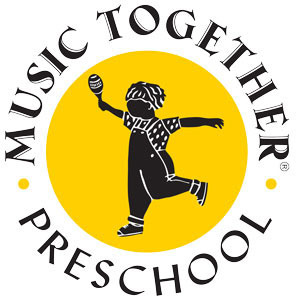 Music Together's preschool music program uniquely integrates music experiences at home with those in school to create a music-making community which supports a child’s language, cognitive, emotional, social, and physical development. Children experience fifty to seventy-five songs a year and become familiar with important aspects of music-making – moving in rhythm, singing in various tonalities, improvising, listening, using language in musical ways, dancing, and “reading” song book pages. Music Together preschool classes include an artistically conceived flow of songs, rhythmic rhymes, instrumental jam sessions, fingerplays, and movement activities. The combination and types of activities are researched-based and support children’s developing competence in tonality and rhythm. In addition, activities evolve from the child’s world and include vocal play, animal sounds, rhythm play, language play, and a good bit of genuine fun. Students in licensed Music Together preschools are not just consuming music; they are becoming life-long music makers. The Music Together Preschool curriculum revives the question “what did you do at school today?” Parents learn the songs their children are singing in class. Children have a tangible connection between home and school by having the same CDs and songbooks in both locations. The connection often sparks dialogue that would not have happened otherwise and creates a sense of community for all involved. Through Music Together, many adults rediscover their own pleasure in making music, develop new parenting skills that support their child’s learning, and gain a repertoire of activities that are fun and educational for the whole family. Children “bring the music home” to their parents through the family CD and songbook. Many preschoolers teach their parents the songs and activities and pretend to be the “music teacher” for the rest of the family. And because of Music Together’s unique traditions of adult inclusion and family music activities for all ages, the entire school community – parents, children in various classes, staff, visitors – learns the same songs.